NASA has also released a brand-new video that describes why the icy moon's vast sea might just be the perfect place to find life beyond Earth. When the primary mission of NASA's Galileo spacecraft ended on December 7, 1997, astronomers decided to give it more work to do -- orbit and study the Jovian moon Europa. Faithfully following instructions, Galileo got to work sending back images and data of the icy planet to Earth for 14 more months. According to NASA, Galileo was so close to the surface of the moon at one point that "if there were something there the size of a school bus, Galileo would have detected it." It's from that extended part of Galileo's mission that theories about the planet containing a potentially life-sustaining ocean of water beneath its crust of ice were confirmed. Now NASA has released a "remastered" photo of the moon that makes it looks like the beginning of life itself -- an embryo. 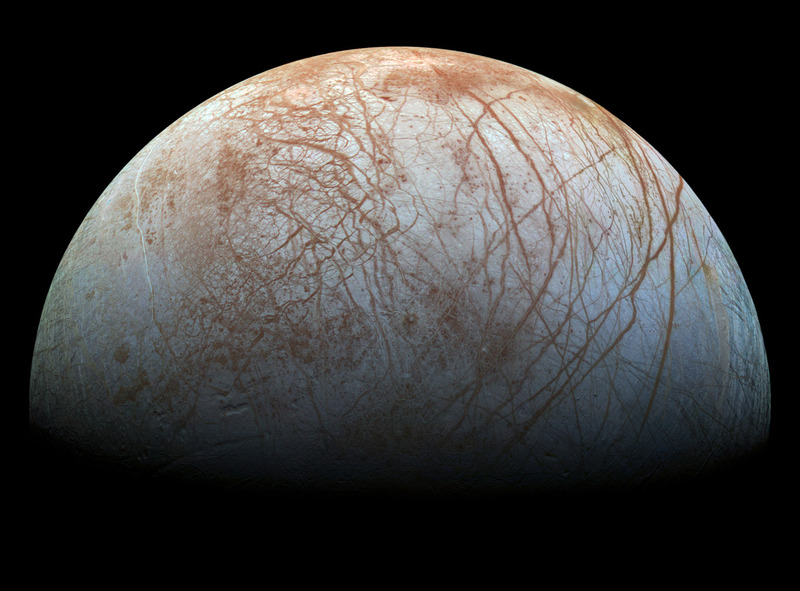 The image had been released before in 2001, but NASA decided to revisit it recently and remaster it into "a realistic color view of the surface that approximates how Europa would appear to the human eye," it says in a statement about the photo. To do this, NASA used images collected by Galileo on its 1st and 14th orbits through the Jovian system in 1995 and 1998. It then combined photos that were taken through near-infrared, green and violet filters to create the image above. "Color variations across the surface are associated with differences in geologic feature type and location," NASA says. "For example, areas that appear blue or white contain relatively pure water ice, while reddish and brownish areas include non-ice components in higher concentrations. The polar regions, visible at the left and right of this view, are noticeably bluer than the more equatorial latitudes, which look more white. This color variation is thought to be due to differences in ice grain size in the two locations." In addition to the reworked photo, NASA has just released this video of why Europa and its ocean (which theories say might be 10 times deeper than our own) might be ripe for life and future exploration, and why astronomers consider it a "game changer."